Quick Review: Haunted by silence, a mute teenage girl is mysteriously given back her voice ... and it is divine. 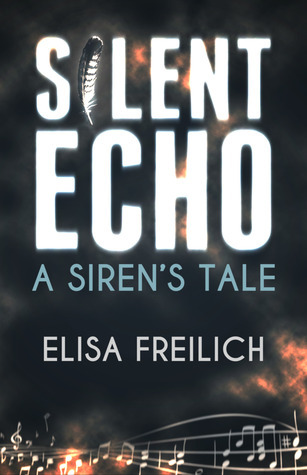 Inspired by Homer’s Odyssey, SILENT ECHO: A Siren's Tale is an epic story filled with fantasy, romance and original music. Detailed Review: This book literally gave me the chills because it was so intense. I must say this book isn't lacking in the mystery and horror department. And the author really did her research, that's what made it so perfect and addictive at the same time. Elisa manages to make the transition from reality into fantasy smooth, going easily with the flow. This is an admirable skill I like in authors. The story was unlike so many other fantasy books I've read so far. First, it was higher on the scare factor, especially in the end. I found that I couldn't stop reading just because of the fact that I was petrified that something would happen if I stopped. Second, the mythology in it is really strong, and not to mention were real. This turns the story into a more haunting one than some stories or myths created by the author himself. The best part in the book though, was admittedly the characters because they gave depth to the story. It felt like they were shaping it, that the story was affected by their actions and words, not something that's made-up. The story felt like it was really happening and I was a spectator. The characters fit in so well with the story, for example Portia's deaf best friend Felix wasn't influenced by her powers because he simply couldn't hear her. He was clearly meant to help her not get controlled by her powers. And like any good book. It has its twists. Good ones that will certainly leave you shocked and restless. Now, this is what I call a good book... This is one hell of a story that will be hard to forget. Brief Review: Mesmerizing and beautiful, this book manages to exploit music in a dangerous and seductive way, such that I got really overwhelmed and scared whenever I read it. Elisa shows consciousness of her readers and manages to surprise and stun at the most unexpected of times. I don't think it needs any more saying, but I'll say it. IT'S AMAZING. I could not bring myself to like the book. It was so boring for me. Great review! Check out my review of it at http://myviewpointonbooks.blogspot.com/! I totally agree with you! I read it a couple of months ago and I LOVE it. Great review!